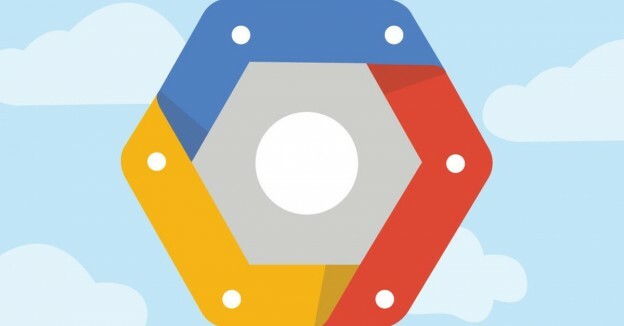 Google have recently introduced Cloud Shell to the Google Developers Console. Cloud Shell provides command-line access to Google Cloud Platform resources right from the browser. Cloud Shell is backed by an f1-micro Compute Engine instance running a Debian-based Linux OS and provides a 5 GB $HOME directory that persists across multiple sessions. The Cloud Shell VM instance terminates after an hour of inactivity. Using Cloud Shell you can manage Compute Engine virtual machines, connect to Google Cloud services, checkout and compile code from Github, etc…, to mention but a few. All of this without having to install any software or SDKs locally, what’s more, Cloud Shell provides a Web Preview feature. You can run Web applications on your Cloud Shell on ports 8080 to 8084 then preview them on your browser through a secure proxy that is only accessible to your account. In this post I will demonstrate how you can quickly build and test Docker images using the Google Cloud Shell. I will also show how these images can be deployed to Google Container Registry, a private Docker image storage on Google Cloud Platform. All the activities in this post were solely performed using the browser. In the past I needed to generate graphs for various complex workflows (see the image below), one library that handles this very well is Graphviz. Graphviz is a powerful open source graph layout and visualisation tool. The graphs are specified in DOT language, which is a plain text graph description language. Unfortunately there is no Java implementation of the Graphviz binaries. So, a sensible solution was to create a lightweight Java based HTTP server called graphviz-server to invoke the Graphviz binaries installed locally. This way I could have one graphviz-server serving all my applications that require graphs to be generated. This HTTP server accepts a POST request with the DOT text as its body, it then invokes the Graphviz binaries installed locally and returns the generated graph in SVG, PDF or PNG. In a previous post, I explained how this lightweight server and its dependencies can be installed on a Google Compute Engine VM. Clone the graphviz-server source from Github. The last argument which is port 8080 is supplied to the command on the container entry point, this will cause the graphviz-server to listen on port 8080. Now the 8080:8080 argument after the -p flag simply tells Docker to publish the container’s port 8080 to port 8080 on the host. The -d flag runs the container in the background in a “detached” mode. You can find more details about these flags here. Now we are ready to activate Google Cloud Shell and build this Docker image. Once you login to the Google Developers Console, the Cloud Shell can be activated by clicking the icon outlined in the image below. Once activated a console opens on the bottom of the page. We run the following commands to create a directory that contains the Dockerfile explained above. The cool thing about Cloud Shell is that it has the Google Cloud SDK, Docker and a few other goodies installed so we don’t need to setup anything. Now we can build the Dockerfile by issuing the following command. docker build -t graphviz-server . If we navigate to the Google Container Registry on the Google Developers Console, by clicking on the Gallery icon then clicking on the Container Engine option on the gallery. We can see our graphviz-server1 image is deployed as shown in the screenshot below. 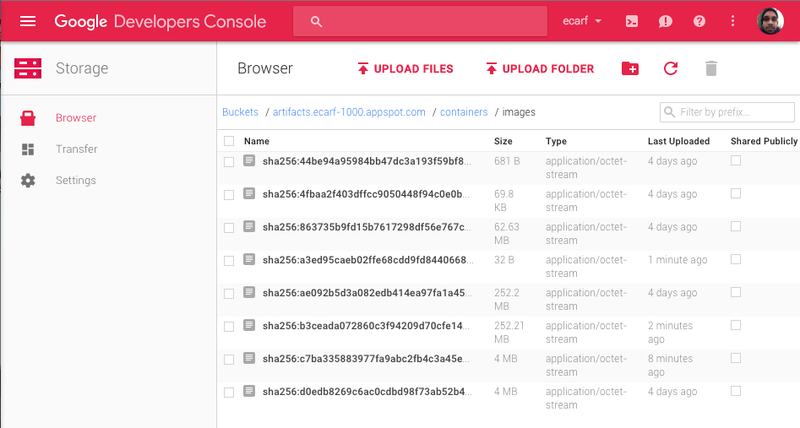 And if we navigate to the Cloud Storage browser you can see a bucket in the format artifacts.your-project-id.appspot.com is automatically created to store the image. 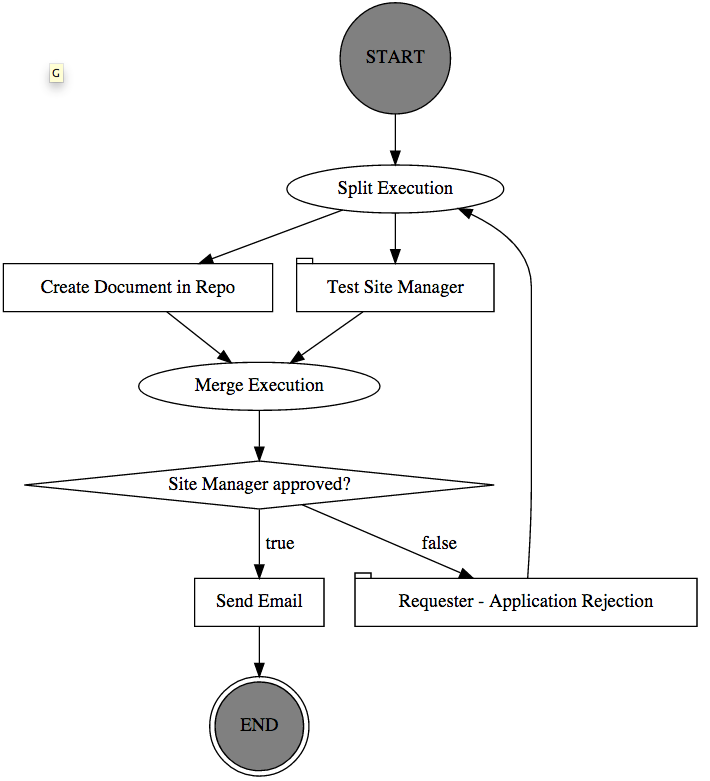 Using the Chrome Advanced Rest Client plugin we can POST the following DOT graph to the server using the Web preview URL https://8080-dot-1975544-dot-devshell.appspot.com/svg and the graphviz-server nicely responds back with the SVG graph shown above. 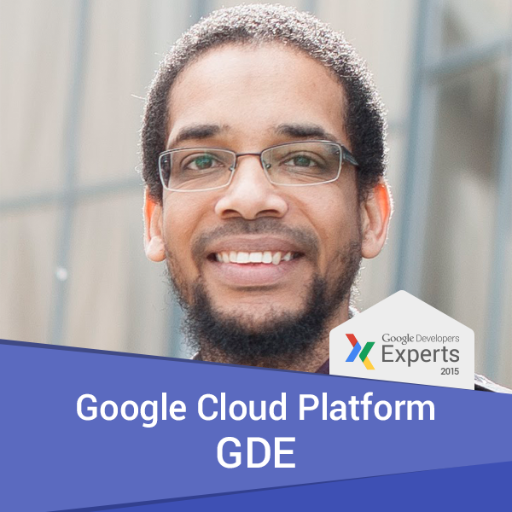 In my next blog post I will be looking at Google Container Engine and I will be explaining how we can use it to deploy and scale a cluster of graphviz-server containers. Stay tuned. 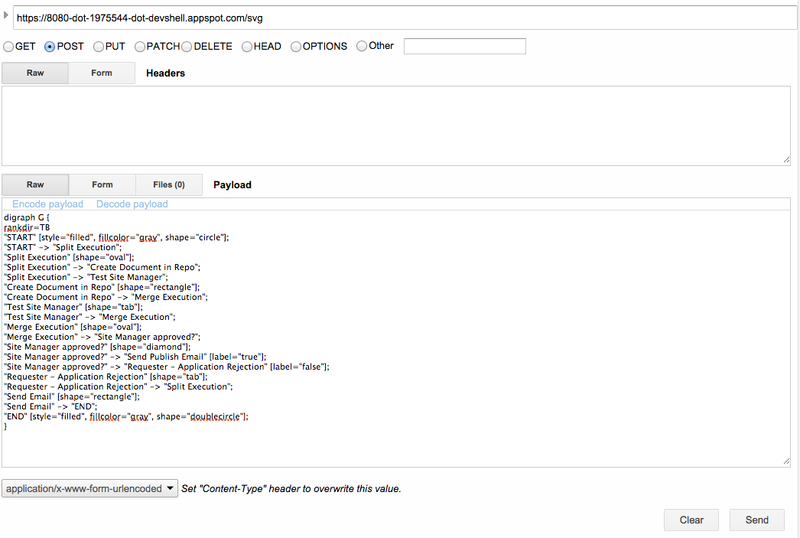 This entry was posted in Cloud and tagged containers, Docker, Google Cloud Platform, Google cloud shell on 17/11/2015 by Omer Dawelbeit.